“You can’t get any more frontline mission than this,” says Adventist Mission director Gary Krause. Adventist Mission has approved $1 million to plant 322 churches in 28 countries, including a unique Millennial-led church in the United States, a youth church in Serbia’s second-largest city, and 34 churches across Mexico. Distribution of the $1,021,407 started this week after the Seventh-day Adventist world church’s Mission Board Strategy and Funding Committee signed off on the Adventist Mission plan. The $1 million in funds came from church members’ direct donations to Global Mission and through the Annual Sacrifice Offering, which is collected in most church divisions at the end of the Week of Prayer. Global Mission, which is part of the Office of Adventist Mission, was established in 1990 to expand the church’s vision of mission and works to start new groups of believers in unentered areas and among new people groups. Last year, a new church was established somewhere in the world every 3.3 hours, Krause said. “The Adventist Church began as a church-planting movement, and it will only continue to grow if it keeps its focus on church planting,” he said. 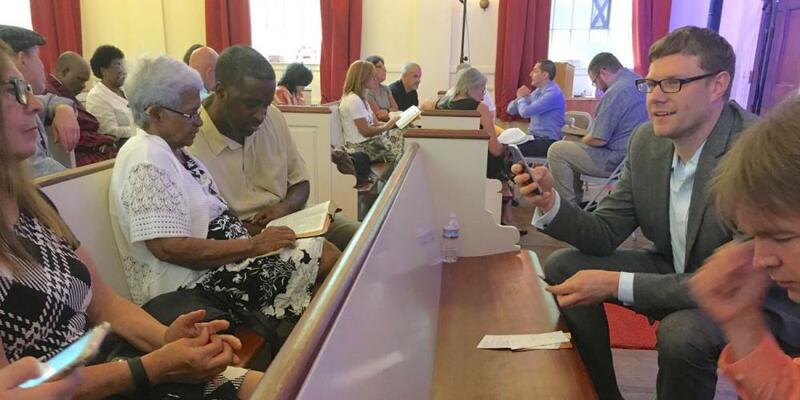 Among the new churches benefiting from the Global Mission funding is One Connection, which is being planted by graduate students and young professionals in Boston, Massachusetts. The church baptized its first seven members in May, and 12 more baptisms are planned for December, said E. Douglas Venn, director of Global Mission’s Urban Centers, who has visited the church. One Connection leaders are seeking to make use of every person’s talents in small groups, community service, and children’s activities. In all, 14 church plants will receive Global Mission funding in the North American Division, including 11 in the United States and three in Canada. The North American Division aims to plant 1,000 churches in the five years through 2020, and Global Mission is assisting with some of those projects. In other divisions, new Global Mission funding will plant 101 churches in the Northern Asia-Pacific Division, which has a goal of increasing church membership across its territory to at least 1 million people by 2020. Currently, the division has about 719,000 members worshipping in 5,549 congregations, according to the world church’s Office of Archives, Statistics, and Research. Global Mission funding will also plant 49 churches in the Inter-American Division, including 34 churches in Mexico. Forty-three additional churches will be planted in the Southern Asia-Pacific Division, and 41 will be planted in the South American Division. Twenty-eight new churches will receive funding in the Trans-European Division, including four in Serbia. The Novi Sad Youth Church aims to reach a new group in the East European country’s second-largest city, Novi Sad. Five churches will be planted in Russia and Ukraine in the Euro-Asia Division, and the final 40 churches will be planted in restrictive territories. Adventist Mission is not identifying the locations because of sensitivities in working in those areas. The Global Mission funding will also help establish two urban centers of influence: a refugee training center in the U.S. city of Houston and a drug rehabilitation center in Kalaymyo, Myanmar. The Houston center, spearheaded by former Global Mission center director Scott Griswold, will offer refugee resettlement assistance, health education, and other services to a growing number of non-Christian groups in the city. The Myanmar center is one of 10 “micro” urban centers of influence that the Southern Asia-Pacific Ocean Division plans to open across its territory every year, said Venn, who served as a missionary in the division for years. In total, Adventist Mission has earmarked about $4.2 million annually for the past three years for church plants and other Global Mission projects, said Jeff Scoggins, associate director of Adventist Mission. “We could distribute even more than $4.2 million if we get enough requests,” he said. He noted that many more church plants have been approved in earlier meetings this year and many more are expected to be approved in December. While giving the green light to the latest $1 million outlay this week, the Mission Board Strategy and Funding Committee also approved a $4.2 million budget for Global Mission projects in 2018. Krause expressed gratitude to church members who are helping spread the gospel through their donations. “Church members around the world support Global Mission financially, but a special thanks to North American Division for the especially generous support of its church members,” he said. Taunts No Longer Bother 9-Year-Old Boy Dadyslau’s parents have noticed a change in his behavior in São Tomé and Príncipe. Marshallese ​Apology Made in Heaven Arno threw the quiz paper straight at Teacher’s face.